After a hurricane, the 24/7 restaurant provides one measure of how infrastructure and supply chains are holding up. A Waffle House on the beach in Gulfport, Mississippi, after Hurricane Katrina passed through the area. On a warm, cloudy morning in the first week of October, in an anonymous office park just outside Atlanta, operations analyst Matt Stark opened a computer program, ran through some data and looked thoughtfully at the results. Out in the Atlantic Ocean, Hurricane Matthew was hurling winds of 115 miles an hour toward the coast of Florida. 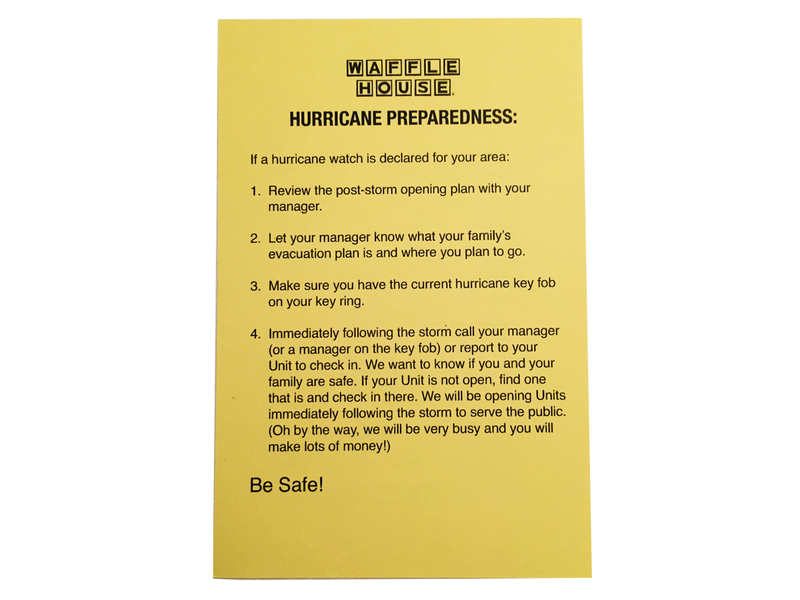 Hundreds of miles inland, in the headquarters of Waffle House Inc., Stark’s software predicted that 477 of the chain’s almost 1,900 restaurants might be affected by the onrushing storm. This meant two things. First, as the storm made landfall, some locations of Waffle House — which boasts that every restaurant stays open 24 hours a day, 365 days a year — would probably have to close because of power loss or concerns for workers’ safety. And second, sometime after they did, someone would invoke the “Waffle House Index,” the slightly flippant measure of how bad a storm can get. And Matthew brought on both those expected scenarios. Waffle House announced Oct. 6 that it was pre-emptively closing some restaurants on a 90-mile stretch of Interstate 95 between Fort Pierce and Titusville in Florida. (In the next few days, as the storm churned up the coast and flooded North Carolina, it would close 98 all told.) And as soon as the announcement went out, media tracking the storm, and customers on social media, invoked the closings as a sign of the apocalypse. In those areas, the Waffle House Index had just gone to red. Disaster responders pay attention to that index, which was created — in the midst of 2004’s devastating Hurricane Charley — by W. Craig Fugate, administrator of the Federal Emergency Management Agency since 2009. Fugate was director of emergency management for Florida when Charley slammed the state with unexpected force: Its winds strengthened abruptly and it went from a Category 2 to a Category 4, and the storm suddenly changed direction and struck the state’s Gulf Coast at Sanibel, 150 miles south of its predicted landfall. Tens of thousands of people were reportedly left homeless. Fugate was in his office with state meteorologist Ben Nelson and members of the Florida National Guard, color-coding infrastructure loss on a map — green for operating, yellow for affected, and red for destroyed — and the group decided to take a look at some of the damage, and try to find a meal. The concept of restaurant operations as an indicator of storm impact percolated slowly into emergency-management culture — the magazine Environment Health Safety Today wrote about it in July 2011 — and broke out into the open around the time of Hurricane Irene in August 2011 (when, according to The Wall Street Journal, 22 Waffle Houses lost power but only one stayed closed longer than a day). But the so-called index isn’t actually an official metric. FEMA doesn’t publish it anywhere; no one, except for Waffle House itself, counts how many restaurants are running lean or forced to close. But the company does give that count to the agency, and FEMA uses it — along with wind speeds and power outages and other objective measures — to judge a storm’s impact, and to figure out where its own crews and other emergency responders can get fed. So far, so obvious: If a storm is bad enough to close restaurants that “never close,” we can agree that storm is bad. Hurricane Matthew was the strongest storm of the 2016 Atlantic hurricane season, which ended Nov. 30. But the Waffle House Index also stands for something less obvious. It is an indicator of how complex and long supply chains are — for food, for fuel, for power — and of what it takes to plan around infrastructure that can be fragile in unexpected ways. But preparation is a complicated endeavor in an economy where few things are sold in the places where they were made. Vanilla comes from Madagascar. The United States imports most of its salt. The plywood needed to protect windows from storm debris might have been manufactured in China, and a storm in the Gulf of Mexico can force enough interruption on petroleum refining to choke off supply on the other side of the country. At Waffle House headquarters in November, Stark and his colleagues on the chain’s storm team — Vice Presidents Pat Warner and Will Mizell and Communications Director Kelly Thrasher-Bruner, who handles social media in disasters — walked me through how they prepare. As we talked, Stark pulled up an updated post-Matthew map. Of 200 restaurants that ended up in the storm’s path, just one, in inland North Carolina, gleamed red, for “still affected”; it had been flooded and needed cleaning out. On the edge of the predicted storm zone — which Stark monitors from a temporary “war room” assembled by putting mobile giant screens in a conference room — the company positions personnel who can swoop in: carpenters, electricians, IT specialists, a food-safety expert and someone to talk to local governments and law enforcement and soothe concerns about curfews. A little farther out, restaurants in other markets line up “jump teams”: spare personnel who volunteer to work in place of locals who might have evacuated or might need to repair their homes or care for family. In Hurricane Matthew, the company sent in an extra 250 people. Waffle House uses one main distributor, Illinois-based US Foods, which has depots scattered across the Southeast, where most Waffle Houses are concentrated, and where many hurricanes that strike the U.S. make landfall. So supplies don’t need to travel far in advance of a storm and are close by once roads are clear. That model of staging supplies and personnel in layers outside an emergency, in order to swoop in quickly once it abates, isn’t unique to Waffle House. It’s also followed by the military and by the Centers for Disease Control and Prevention, which oversees the Strategic National Stockpile of emergency medications, vaccines and antidotes for natural disasters and biological attacks. “We think about, What are the timelines in which people have to be provided medications?” Greg Burel, the stockpile’s director, told me. “Our primary stock is laid down in undisclosed locations around the country that give us access to large swaths of the population and that are accessible” by more than one type of transportation. But the CDC also puts smaller, lighter assets — the equivalent of a temporary field hospital or a stash of medications that could be deployed immediately — “as far forward as we can if we have advance notice, but not so far forward that it becomes victim to that event,” Burel said. The first rule of operating in a disaster, though, is keeping personnel safe. Every Waffle House employee gets a key fob with lists of relevant phone numbers. Local managers keep track of who has challenging home situations — disabled parents, children with special needs, single heads of household — and might need extra help. Every location has a wall-mounted “crisis response” flier that includes detachable wallet cards listing personal-preparedness steps for hurricanes, tornadoes and ice storms. The storm team examines what worked and didn’t after every disaster, each time learning new lessons. In Hurricane Katrina — when they closed 107 locations in Mississippi and on the north shore of Lake Ponchartrain — roads were so bad they stashed supplies in a refrigerated semi-trailer with armed guards, and fuel so scarce they brought in their own tank trucks. When Katrina struck in 2005, Twitter had not yet launched; now Bruner uses it not just to alert customers to closings, but to crowdsource whether roads are open and where the power is on. Waffle House began working on storm response before Katrina — Warner said he thinks the first organized attempt was Hurricane Hugo, which hit Charleston, South Carolina, in September 1989 — but from then to now, the company’s biggest need in disasters hasn’t changed.